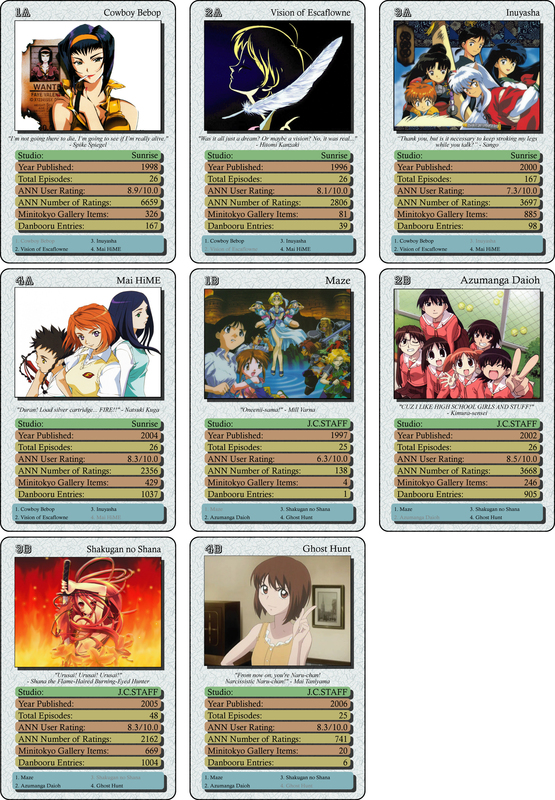 In the last few days I finally found the will and time to do something I regularly thought of: A top trumps game featuring anime shows! Okay, maybe the idea sounds rather unspectacular and also a bit childish, even boring maybe, but if you think about it a bit, top trump cards are a great way to compress information about a specific topic into a rather small shape, making it easy to compare different aspects of the topic. This topic can be cars, tanks, dictators, even poets or elemental particles. As long as you can find some numerical data to differentiate the different aspects you can put them on cards to compare them. And even if you don’t want to play with them, the set of cards can still give quick overview about the spectrum the topic has to offer. And in the least there might be some nice pictures to look at. I always wondered why nobody already did this for anime shows (or at least I never found somebody who did this, except of this short lived, but none the less nice attempt). So here is my try on this, hopefully with a not too crappy card design. The further plan is to put 8 new cards online each new advent, leading to a full set of 32 cards shortly before christmas. Those 32 cards are divided into 8 groups of 4 animes sharing the same studio. This concept won’t be always true, because there are some animes I like to add of studios that won’t contribute any other shows. I only put animes on the cards I have watched myself, but I highly encourage everybody who misses his favourite show here to create his own cards, using my design or creating a better one, I will be happy either way. Now some short words about the numerical data I used. I tried to find some rather objective ways to compare the different anime shows and the obviously first choice was a ranking from 1 to 10 points given by the varied people who have watched the anime. Ironically this value might be the least significant one of all used because most of the time only people who enjoyed or really disliked the show invest the work to rate it afterwards. The majority of viewers with no special feelings toward the show will never influence this rating. Thus, the next value I chose was how many people rated the anime, leading to a number that increases for shows which highly polarise its viewers, in a positive or negative way. I took both values from ANN because it has the highest number of users rating animes out of allt the sites I know that have such a feature. Furthermore I’d like to have some data that express how much extra work the studio and the fans invested into the specific anime. For this I chose the number of image entries of two different image boards, namely Minitokyo and Danbooru. The idea is that the number of entries of the first one is higher if there is a lot of material about the show to scan and the second one is higher if many users are willing to put effort into creating art about the show. Of course this imaginary borderline between those to sites is really just imaginary, lots of fanart is also featured on Minitokyo as well as many scans can be found on Danbooru, but at least the tendency should be correct. Also the Danbooru entries are often of a more sexual content, so the difference between Minitokyo and Danbooru gives a vague information about the kind of fanart that was made about this anime. The last data I chose to list is the year the anime was published. Normally the anime of the studio with the earliest year will be the first one of the four, Cowboy Bebop is the only exception of this rule because it’s a tradition to put a “top trump” on the 1A card. Cowboy Bebop has the highest user rating of all cards, thus being the top trump of the whole set. If a high or a low value in all these categories is preferable I leave to everybody to decide themselves. Also one should always remember that those values are momentary ones, bonded to the date I copy&pasted them from the internet sites. In a few days, months or even years these might and will change with no doubt. After having collected all this numerical data I’d like to add at least a little personal touch, so I added a little quote under each shows picture. This gave me much more work than I anticipated in the beginning, because while some animes have a variety of memorial quotes to choose from, listed on many internet sites, a lot of other animes are quite the opposite. Thus sometimes the featured quote is just the first sentience that came to my mind thinking about that anime. Therefore, those quotes are often not the best examples of meaningfulness. Kannagi just gets better with each episode. It’s not like that there are any revolutionary new things done here, but what is done is done well and with just the right amount of self-mockery. I guess it also helps that Jin is a rather believable male protagonist, the minor characters can deliver some comedy on their own and, of course, that Nagi and Tsugumi are just fun to watch. After the first six episodes of Clannad ~After Story~ I wonder if there is actually some after-story left to tell about the main characters after their respective main stories were told in the original series. Beside of Nagisa and Tomoya, who are practically bound to appear a lot, the other characters were demoted to a few cameos here and there in the last five episodes (with the first episode featuring all Clannad characters for a quick reintroduction I guess). Not that those episodes were wasted time, quite the opposite for sure, but, for example, Misae made no impact to me at all in the original series. I don’t have anything against watching the stories of the minor characters, but I would like to see a stronger integration of the main characters in them, because in the end they are the ones I’m watching this series for in the first place. After all, one of the major advantages Clannad had to, for example, Kanon is the fact that its girls didn’t “disappear” after their individual arc was done with, but still appeared in and even affected the later episodes in some degree. This is something I’m missing so far in the ~After Story~s. Thank you! Very, very much! You are currently browsing the Anime Afterglow blog archives for November, 2008.